A high profile community dance performance for underprivileged Palestinian children, Muslim and Christian, was the product of over 30 days of intensive daily training during the fasting month of Ramadan. 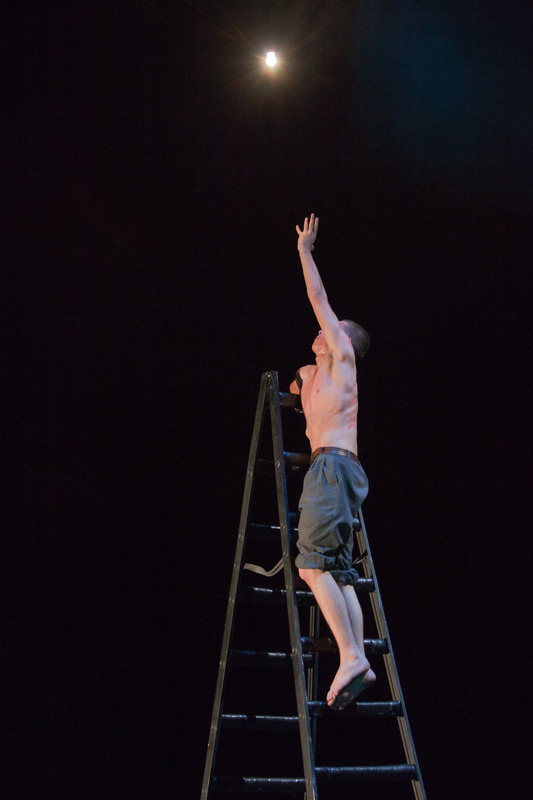 Subsequently the performance toured the West Bank performing free of charge, paving the way for the creation of a local community dance movement led by the Palestinian dancers and teachers, who – simultaneously with the children – received initial training in Community Dance on highest artistic and pedagogical levels by a team of trainers including Royston Maldoom. 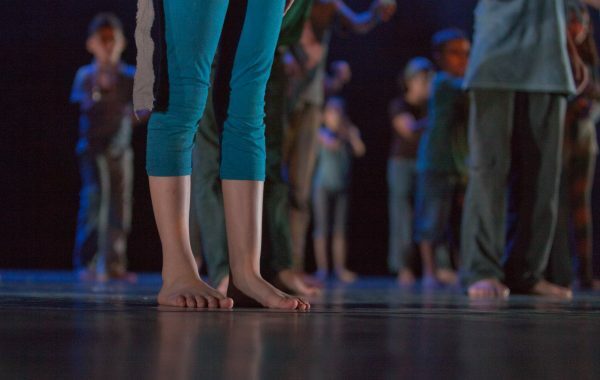 100 – 130 children (aged 6 – 18) worked daily for a span of 5 weeks (July 20th to August 23rd 2011) with Royston Maldoom and Mags Byrne, assisted by the dance teachers Natalie Fend, Lina Höhne and the dance therapist Catherine Vitte. They were also assisted by some local dancers of the Popular Arts Center and Birzeit University, who had previously attended the train the trainer course. The local dancers had the chance to practice their attained knowledge under the mentorship of the world’s best and most innovative community dance artists and facilitators. The rehearsals resulted in a dance performance titled “EXILE” to the music of “Harmonielehre” [Harmonics] by the composer John Adams. The performance toured the West Bank performing in Jerusalem, Ramallah, Zababdeh and Bethlehem between the 23rd – 28th of August free of charge. 90% of the children were chosen from disfavoured backgrounds were they never had any arts classes, neither dance nor music or else. 10% were privileged children attending private dancing classes at carious cultural organisations. Although the community dance team worked with around 200 children, the premiere comprised 110 participants. 49 participants were from the area of Jenin (18 Tammoun, 31 Zababdeh), 39 participants came from Jifna, 22 participants from Ramallah, Al-Bireh, Sinjel, Toulkarem and others. 13 participants were dancers at the Popular Arts Center or elsewhere. A Uniform was provided for the participants to maintain equality between the participants independent of their social status. Each participant received 2 sport t-shirt and 2 sport trousers. During weekdays each group had two rehearsals of six hours each in addition to two rehearsals of six hours each in which the two groups came together. During the fifth week both groups worked together on stage for 6 hours daily at the Ramallah Cultural Palace. The project provided youth with a multifaceted experience; a social, physical, emotional, cognitive and intellectual experience where important social values such as commitment, enthusiasm, respect, interest and passion were mediated. They were encouraged to work at their best in all the fields of life and most importantly they realised that they CAN do and achieve anything if they really want it. 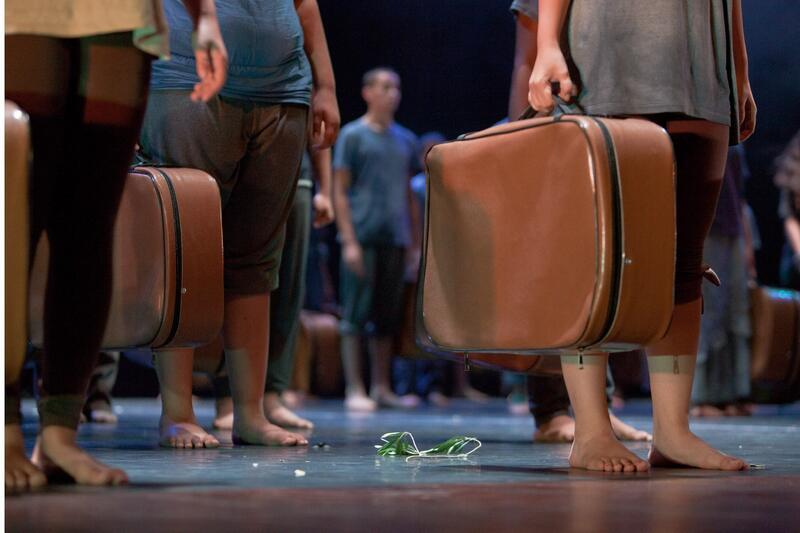 During the EXILE rehearsals the community dance team worked with around 200 children from numerous communities in the West Bank: Zababdeh, Tammoun, Toulkarem, Jifna, Ramallah, El-Bireh, Sinjel and others. The selection of the target group was based on the belief of YANTE and its partners that any local culture weakens and degrades if limited to the privileged and the elite. The premiere comprised 56 females and 54 males from Muslim and Christian families alike. The age of the participants ranged from 8 to 22 years, with an average age of 14 years. Many positive changes of attitude were observed among the participants. To name an example, there were three male participants from religious Muslim families. At the beginning of rehearsals they were sceptical of the project and the prospect of men dancing, and were undisciplined in the first two weeks of rehearsals. Starting week three they became very focused and disciplined in rehearsals, did not miss a rehearsal though it was Ramadan and they were fasting all through it and even on Fridays where they went to prayer they were punctual. During week five they were very active in distributing flyers and hanging posters around Ramallah & Al-Bireh, Jenin, Zababdeh and Bethlehem. During week six they helped with stage set-up / tear-down. where great change could be observed were from Christian families. During the first two weeks, although generally well disciplined, they had a very negative, almost racist attitude towards their fellow Muslim participants. Starting week three change could be perceived as they were observed helping a couple of Muslim participants memorise a dance sequence. By the end of the project the trainers observed full consolidation of participants. In another case, three participants were generally aggressive during the first thre weeks of rehearsals. Their aggression started to subdue in week four, however it was only when stage rehearsals started in week five that the behaviour of those participants took a drastic turn. The participants emitted positive energy that contributed to the rest of the group. On a different level, one of the participants showed signs of anorexia at the beginning of rehearsals. The importance of food was openly discussed with the participants as a whole. In addition, the child was closely observed at breaks, and close coordination was held with the child’s mother. Towards the end of the project the team noticed positive change in the participants’ eating habits. The number of spectators at all four performances in August, with Ramallah on the 23rd, Jerusalem 25th, Zababdeh 27th and Bethlehem on the 28th was estimated to be 3000 persons altogether, whereas it is worth mentioning that a few were so taken by the premier that they joined us at one or even two of the performances that followed. The audience comprised Muslims, Christians and Jews of all age groups mostly local with some internationals, hence most social strata where represented at the performances. The EXILE performance and the community dance movement as a whole received much interest within the Palestinian society. This became evident through the number of people in the audience, their feedback, the interest of social figures and local organisations in the project, the participants feedback, as well as the immense press coverage the performance received. After the performance YANTE succeeded in establishing cooperation with various local organisations that had been part of the project, such as Birzeit University, El-Funoun, Dar El-ti Al-arabi, the Latin Convent School Zababdeh, Jifna Club, the Friends Schools and many others. I have to be honest and say that this was the most moving, inspiring and powerful performance I have had the privilege of experiencing in years. From the moment the curtain was drawn and John Adam’s striking E minor opening chords from “Harmonielehre” resonated throughout the auditorium, to the moment the show was over, my entire body was covered in goosebumps. I was taken on a journey. I felt the children take hold of my hand and lead me through their struggles, emotions and victories that led them to that stage and to that night. To know that ninety percent of the children on that stage came from underprivileged backgrounds and to see them have a chance to reach out to audiences in this way and express themselves… it’s really hopeful to know that there are so many sponsors and supporters of this project here in Palestine. To know that now there is the possibility for one of these kids or more to grow up to become choreographers and create their own shows is so exciting. John Adams’ states that he had a dream of a San Francisco supertanker being launched into the sky before writing the first movement, and as the children held the smallest boy up above their heads with the rise of the music, I trembled with the power this image of Palestinian youth being launched into a dream world had. The theme of “exile” and displacement is one every Palestinian can relate to, and to see these children performing on stage, showcasing so much talent and beauty and strength, was very touching. Too often when we think of art and dance and music, we box it up in this elite and distant package and rarely try to envision what possibilities lie outside of it. While several of the audience members may not have had the same experience I had, or laughed, or were amused instead of shaken, I believe that this kind of community project is what really makes a difference for the general well-being and future of not only our children but our adults who are so often feeling hopeless or tired or weary of the future. For me personally as I was watching it I was reminded of the power that community has no matter what the circumstances. While every child had a suitcase, their own personal history and baggage, in the end what mattered more was feeling that they had a future and a place in their community and that they could work together to create a place and meaning for themselves in this one life, this only life we have. As is the case in all pilot projects, the artistic and organisational teams strode carefully with open sensors through every day searching for signs and impressions. The plans had to be constantly changed and adapted, even before the project kicked off. Here are some of the challenges the team faced. Finding suitable performance venues was the most time consuming task. Generally the most difficult challenge was finding a venue with a big enough stage to accommodate 130 children. Jerusalem was most difficult as the permits of the team members were only issued by mid August. Hence coordination had to be mostly done per phone and email. After consulting and negotiating with venues like the Palestinian National Theatre, Notre Dame, Yabous, YMCA East Jerusalem, Al- Hambra Palace a.o, it became clear that none of the available stages can accommodate the number of children and type of performance where backstage areas and stage exits are necessary. Hence the only option was to build a stage in an open-air venue. The prices for stage and light rentals were generally very high, but in Jerusalem they were not affordable for they were at least three times that of Ramallah or Bethlehem. The team realised the importance of gradually acquiring a stage and lighting equipment owned by the Palestinian community dance movement to insure the sustainability of the trainings. The programme took a little time to get going in Zebabdeh. Although the municipality and many civil society organisations were enthused by the project, they had problems distributing work amongst each other due to unsettled tensions and rivalries. As misunderstandings with the host in Zababdeh, the Latin Convent School started to unleash shortly before the onset of the project YANTE felt complied to focus its efforts on clearing those misunderstandings and not meddling with the internal dynamics of the town. Luckily these difficulties could be overcome. A positive outcome from the initial confusions and continuous talks was the inclusion of a group of boys from Tammoun in the project. Parents as well as children did not know what to expect from the project, which is why it took some time for the parents to understand the importance of commitment and discipline for the success of the work. Many parents came to the team members after the performance and gave the feedback that only now after watching the production, they realise their children weren’t attending just another summer camp to kill time in the long summer months. Unexpected though were the problems that arose on the basis of religion at the outset of rehearsals. Quite to the contrary it was Christian families who objected to their children intermingling with Muslim children. Some of the Christian children were forced by their parents to leave the project in the beginning of week two. However half a dozen girls managed to convince their parents to come back. Some came back during week three and few could not join before week four. To catch up on the material they had missed out on, those children were then given special attention and support by the team and other children. Often the team had to deal with the absence of children, dishonesty, inconsistencies, and calls from parents wondering why their children are not allowed to miss three days of rehearsals to visit their grandparents. Additionally the team observed symptoms of Post-Traumatic Stress Disorder. Verbal and physical violence was not new to the children. Not only amongst each other and towards the team they showed violent behaviour, but also public property was a common target to discharge violence. At the outset of the project many children did not handle the facilities of the Birzeit University with care. By the end of project the children were able to keep the yards and toilets clean, keep quiet in the corridors and sports hall, and put the sports equipment back in its place. The children’s verbal and physical violence amongst each showed in different constellations: 1) A child against another from the same town or village or 2) a child against another from a different town or village that almost always turned into rivalries between the two villages/towns. During the first two weeks the team had to deal with aggression of Zababdeh vs. Tammoun and Jifna vs. Ramallah/Al-Bireh. Week three was the climax where serious interventions were necessary. By the end of the project, especially after the stress of the premiere was over, the aggression subsided in the group. 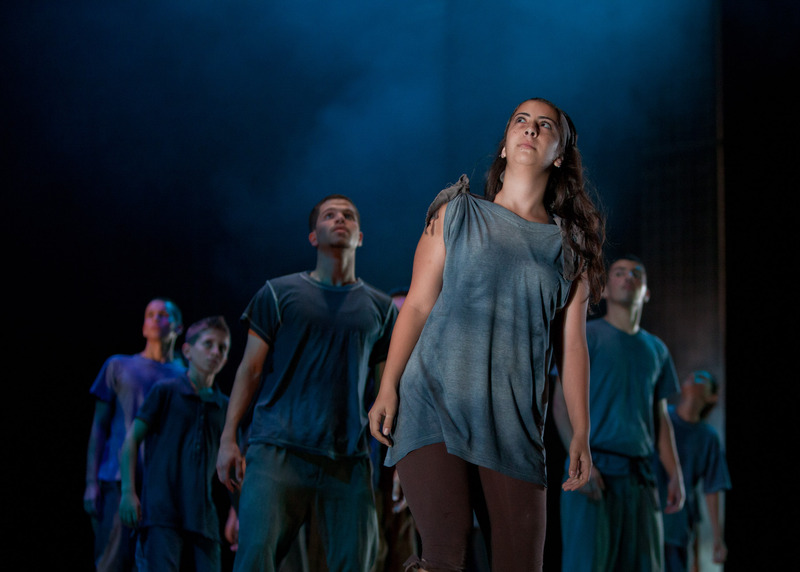 The fact that many of the children were able to visit Jerusalem for the first time in their lives and send such an important political massage by performing a piece titled EXILE in Jerusalem, was in itself a success for the project team. It was however very sad that, although more than 100 permits were issued by the Israeli Civil Administration through the efforts of the German Representative Office in Ramallah, one of the dancers was considered a “security threat” and we were unable to attain a permit for him, and hence had to miss out on the performance.